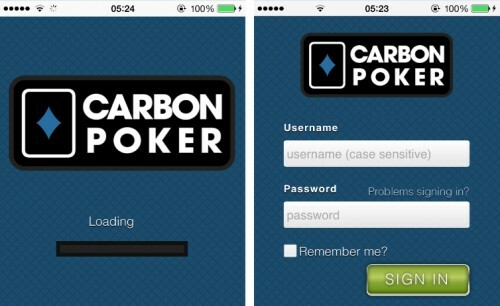 Carbon Poker launched the first mobile app for U.S. players in September 2013. Play real money poker or bet sports on the move from the comfort of your mobile phone – compatible with all Apple & Android devices. If you haven’t already done so, download the Carbon Poker client on your home PC and register an account. Carbon is also Mac compatible. Keep your login and password secure. Launch Carbon Poker from your iPhone, Android, or iPad for real money online poker on the go! Mobile play earns player points as normal and counts towards clearing your $5,000 welcome bonus. The Carbon Poker mobile app is browser based on all devices so there’s no need to download and install an actual application. Americans and rest of world players can enjoy real-money Limit, Pot Limit and No Limit cash games wherever, whenever, instantly, with just their phones and an internet connection. Mobile players can join one table at a time of Heads Up or 6-Max poker, across No Limit, Pot Limit and Fixed Limit game types. Currently just Texas Hold’em is available.